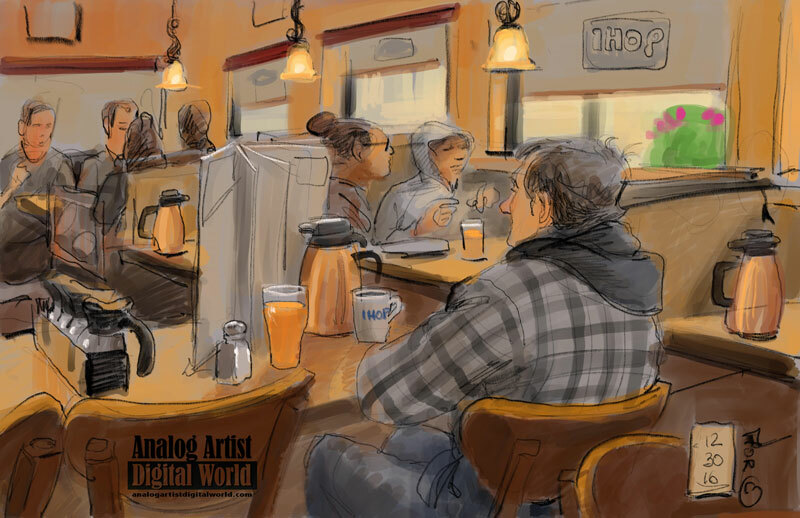 Analog Artist Digital World: Déjà vu at IHOP. Driving back to my downtown apartment, I decided to stop at IHOP (647 E Colonial Dr, Orlando, FL 32803). I almost always get an eggs and ham melt and a Mountain Dew. The place was packed. I've never seen it so full. People must have been eating out in the gap between Christmas and New Years. There was a commotion as I entered. A waitress said "I'm not serving him!" "But he has money." replied the maitre d'. They weren't talking about me as it turned out. There was a disheveled man walking between tables holding two plastic shopping bags full of clothes. His fingers were like gnarled tree roots. He wore a black hoodie and a grey flannel jacket. A tall waiter got him seated and served him orange juice and a coffee. He returned several times to check up on the gentleman who was too disoriented to order. He kept muttering to himself "Déjà vu' Déjà vu". He knotted his fingers into the shape of a gun, or a heart, then shouted, "Sean Connery is wrong". The waiter asked him to keep his voice down and once again asked if the gentleman would like to order anything. He said, "I like the juice." Since I've been sketching Pulse survivors and listening to their stories, I am on the defensive when it comes to unpredictable behavior. The man kept sprinkling salt in his hand and then licking it up. I needed to sketch to calm my nerves. The folks at the table next to him got nervous and got up to leave. As they were leaving, he leaned over and shouted, "Can I have that!" He wanted a used napkin. The flustered costumer said "You might be better off getting a new one since this was used". He wanted the napkin regardless. The waiter returned and finally convinced the man to order some French toast and sausage links. He explained "I'll cover the bill, we need to look out for each other. Next time you see someone in need, help them out, you hear?" he told him. "It is what we do for each other. We need to protect our humanity." I'm not so sure the man understood. I've often thought that had some one reached out to the Pulse shooter in the weeks leading up to his insane flash of anger and hatred, perhaps he could have been defused. Perhaps in a perfect world, generosity and kindness can stop hate. The stranger at the table in front of me finished before I did. In his conversation with himself, it sounded like he had just arrived in Orlando, as if he had been left here. Thanks to his guardian angel waiter, he was welcomed and respected at IHOP. I left the usual tip for the waitress who wanted the man removed, who happened to serve me. Then I found the waiter who had treated the man with such respect at the soda fountain and I gave him twice the tip, thanking him for how he treated the man. He seemed surprised but glad. I need to love and respect the people that remain in my life. This New Year brings uncertainty, but this holiday feast reminded me of what the holiday season is all about.